Mariposa's Tales MARIPOSA'S TALES: My First Tuesday's Tales! As mentioned in my previous week's posts, I will start my own blog activity every Tuesday here...I invite anyone to join me! This photo was taken many about more than 6 years ago. I just met the IT Guy then. This was a party thrown by moutaineers after a successful climb at Mount Manunggal. Take note how thin and skinny I was...and how awkward I looked! LOL I am so happy with my weight now...it was quite a struggle for me to get to 100 lbs. The place was Camp Zitro and I was the host/emcee for that night. 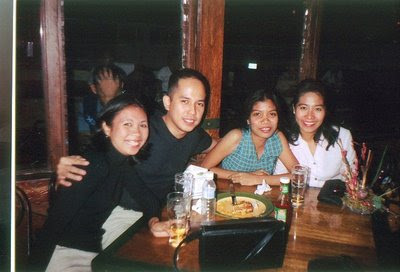 Details are vaguely remembered yet I alway look back to this night as one of my most fun night out with friends. The two wonderful ladies are my good friends, Rosh and Pia. And of course, it's the IT Guy beside me...that was before I ruined his diet and gym schedule! We were drinking that night and not knowing how easily IT Guy gets tipsy...we allowed him to drink. On the way home he offered us a ride and I had to scream when I saw him driving with his eyes closed. When asked if he is sleepy and if he wants me to drive, he just replid, nope, I'm just resting my eyes. WOW! But that was the last time I saw him tipsy while on the wheel. He is a very responsible driver...minus that incident. I miss these moments...my work is limiting me from going out often with friends and Rosh is already married and Pia is in another town. Though we still get together, it's not just the same anymore...but I'm happy that one thing remains though despited all, we're still good friends and we manage to be there for each other despited the distance and the hectic schedule. It's lovely to have wonderful memories and nice photographs to remember them by! Wonderful story ok glad that IT Guy doesn't drink and drive any more. This was excellent. So fun to hear of the past. Looks like this will be interesting! Ok mine is up as well! Maybe the most influential paper I have read all year!! !